Кливлендский центр ELS расположен на территории студенческого городка Case Western Reserve University. Case Western — престижный частный университет. По рейтингу журнала U.S. News & World Report он вошел в число 50 лучших университетов США. Кливленд сочетает в себе развитые взгляды современного города с традиционным мировоззрением старушки-Америки. Кливлендский оркестр, Музей современного искусства, Музей естественной истории и Ботанический сад — все это менее чем в восьми минутах ходьбы от центра ELS. Host family students are responsible for their personal transportation. Most students use the bus and train to come to campus. Hazel8 Apartments is lcoated in Cleveland's beautiful University Circle. The apartments are in the perfect location right across the street from the ELS/ Cleveland center with easy access to all the amenities of Uptown Cleveland and Case Western Reserve University campus including restaurants, shops, museums, gym, and easy access to public transportation. Hazel8 is a new and modern apartment complex in the heart of University Circle. 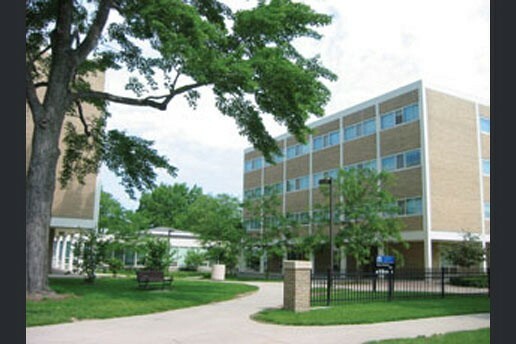 ELS students will enjoy spacious double rooms with large windows that accommodate two students. The apartments offer a roomy kitchen, with granite countertops and large kitchen island, and a large living space with hardwood floors in each apartment, as well as a private balcony/patio and the common courtyard with patio, grill, and outdoor fireplace. The furnished apartments also include a washer and dryer, all utilities, and internet. Quick facts: \*Amenities in Unit: Living area with custom hardwood floors, private balcony/ patio, central heat and air conditioning, washers and dryers, TV. \*Bathroom: Hallway shared bathrooms, 2 students sharing a bathroom \*Parking: Not included \*Students can enjoy free internet and apartment amenities. In addition, utilities and linens are included in the rental price. \*Security: Secure building in a safe area of University Circle Cleveland. Apartments have private entrances and an on-site manager.